Our lack of seed-raising facilities at the moment, coupled with a desire to learn how the Portuguese organise their planting calendar, has this year taken me to the weekly markets on a regular basis to see what seedlings they’re selling. It’s a safe bet there’ll be lettuce and cabbages. They’ve been a steady fixture from January right through to September. But it’s the other stuff that’s intrigued me. Sometimes you have to look quite carefully for it. At other times every stall is full of it, but for a couple of weeks and no more. In the latter category were bunches of beet-like leaves with almost dayglo orange roots that were suddenly on every stall at the end of April. About the same time as similar bunches of beetroot seedlings were for sale. Picking up a bunch of beetroot seedlings, I asked what the orange-rooted seedlings were … “beterraba” … “beterraba também?” … “sim” … beetroot, then. Thinking it must be some special local variety, I thought I’d try some, so they were planted out in the raised beds along with the ordinary beetroot. Time went by and they grew and grew. And grew … I was starting to think of the Russian children’s story about the Giant Turnip. 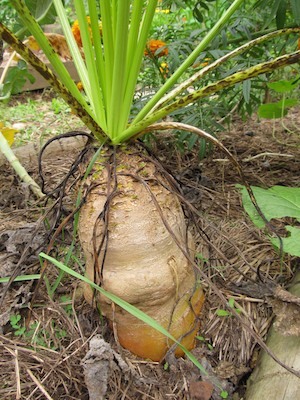 Finally a visiting friend of a friend recognised them as fodder beets (Beta vulgaris L. var. alba). Animal food. I Googled fodder beets. 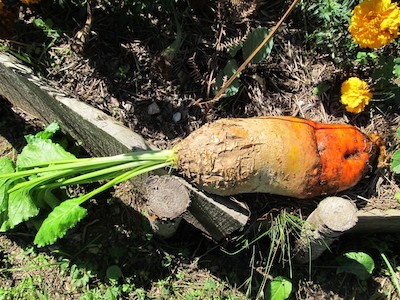 It took me a while to find images that matched the dayglo orange colour, but it finally dawned on me that yes indeed, I was growing mangelwurzels. We’ve found them to be perfectly acceptable human food. So much so that friends who’ve tasted them here are intending to grow them for themselves next year too. The flesh is white but the appearance, taste and consistency are not unlike the normal red beetroot, just sweeter. 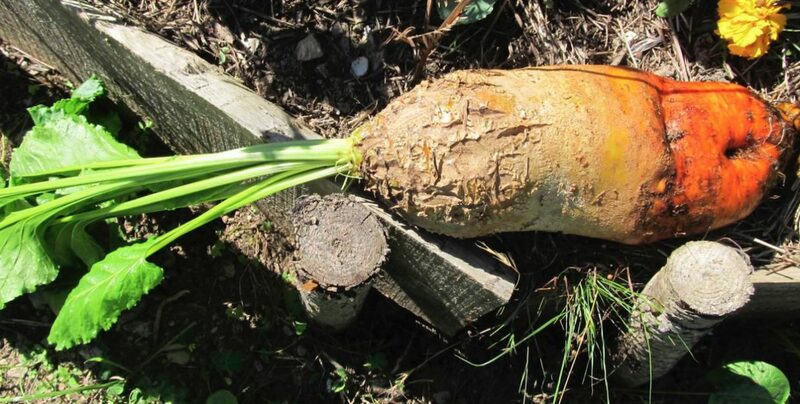 A single beet can make a good hearty soup to feed up to a dozen people, using both root and leaves. This is a great value, nutritious plant that needs little special care in the vegetable garden to give a substantial yield. But better yet, who could possibly resist having a plant called a mangelwurzel growing in their vegetable patch? Certainly not me. I’ll be growing them again. Fry chopped onions in butter. Add diced beet, chopped or crushed garlic, ginger and spices and sweat for 5 minutes. Add vegetable stock to amply cover and simmer until beet is tender, about 20 minutes. Remove from heat and liquidise roughly. Add chopped beet leaves and return to heat. Bring back to boil then remove from heat. Allow to stand 5 minutes and serve. More details and organic growing care hints here. ah so you found a use for them!Are they of any nutritional value do you know?They seem to like growing in your garden so am interested. Since all cultivated beets are subspecies of Beta vulgaris, they should have roughly similar nutritional value. Equivalent to the usual beetroot. Which is pretty high. Going to try some other beetroot-type recipes on them. The soup is delicious. We decided to try them for ourselves for the first time today, grated in salad as we’ve no beetroots growing at the mo. Didn’t really notice them to be honest, but sure they are a good nutritional addition so will keep using them and will defo try your soup recipe. Horses also had them for the first time tonight, with their normal feed: Maurice tucked in and licked his bucket clean, Albert wasn’t quite sure but ate it all up, and Frankie ate the beets but left the leaves. I’ve got lost in that time warp again and backtracking three years, but this post was obviously calling out to me this morning! I’m loving the selection of ‘animal’ beets available. My own experience is that goats won’t touch them other than the leaves, but that’s probably because I’ve gone to the bother of growing them for them. If they were to escape into the veg garden I’m sure the situation would be very little different …. Just as well then that the people in my house enjoy them! Thought you might enjoy this photo of one of my latest batch. No idea what sort they are, but certainly the most cheerful thing to come out of the garden this year. Hahaha! Isn’t that just goats? But where did you get the wondrous stripey beets? Market?